The game is a point-and-click RTS. Play campaign mode first to get introduced to the game. You control the game with the mouse. Your defense buildings work completely automatically : all you have to do is place them. Click on buildings in the right-hand menu panel to select a building type, then click on the ground to build that thing. Zombies come when time reaches zero! Plan your energy economy by day so you can afford to defend yourself at night, but be careful! Too much smog and garbage (the byproducts of your industry) will just make the zombies stronger! Also, press the green "help" button for detailed instructions. 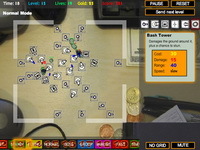 Single player 3D Open Field Tower Defense game. 8 different types of aliens with their own personality and 20 levels each with unique and friendly 3D cartoon environment. 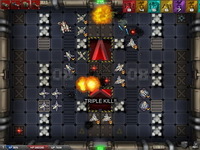 Combine the powers of five unique towers, build a maze of towers to stop the aliens and find the best strategy for each of the 20 levels. Use the power of clouds, lakes and supports.